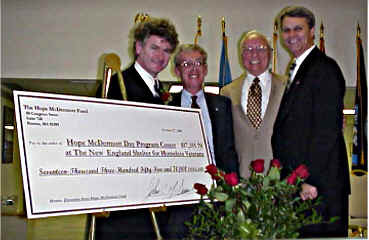 John McDermott established the Hope McDermott Fund in January of 2000 shortly after his mother, Hope passed away. Mrs. McDermott suffered a heart attack in November of 1999, and fought bravely, amazing doctors who originally predicted she might only have days to live. Hope was born in Scotland, and married Peter McDermott of Donegal, Ireland. She and Peter became the proud parents of twelve children, of whom John is the ninth. They moved from Scotland to Canada in 1965. Peter McDermott, John’s mentor and greatest musical influence passed away in 1995; John memorializes his parents onstage at each performance with his father's cap and cane and his mother’s scarf. John often says that he inherited his dad’s voice, and his Mom’s good looks – clearly John and his brothers and sisters inherited much more than that. 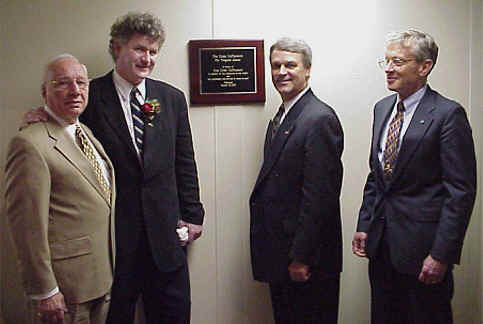 On October 12, 2000 John dedicated the opening of The Hope McDermott Day Program Center, a newly constructed annex of the New England Shelter for Homeless Veterans, named in honor of John’s mother, Hope, who passed away in January, 2000. The goal of the Hope McDermott Day Program Center is to reach out to veterans who are chronically homeless and who are the hardest to service of the homeless veterans. The Day Program Center will provide counseling and living-skills instructions to these veterans, as well as make sure that their basic needs (food, clothing, health care) are satisfied. It is a unique opportunity to fill a gap between the transitional services that the New England Shelter for Homeless Veterans currently provides and needs of chronically homeless veterans. Hope McDermott's legacy is humility, service, compassion, and courage. She was not famous, and did not receive great public acclaim during her life, but true service is not boastful. Her passing in January of 2000 inspired her son John, the ninth of her proud family of twelve children, to formalize his organization in his mother's name - The Hope McDermott Fund. John realized that his seemingly infinite work ethic, his great success as a performer, and the balancing force of his keen sensitivity to the happiness and well-being of others, were all a direct result of Hope McDermott's Nurturing hand. John's special dedication to veterans also came as a result of his mother's influence. 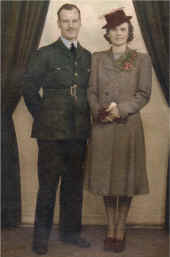 She recognized that the health and good fortune her own family enjoyed were in no small way ensure by the supreme sacrifice of her brother, Michael Griffin, in Bataan, and the courageous service of her husband, Peter McDermott in the Royal Air Force during World War II. The importance of honoring sacrifices of those, like Michael, who did not return, and [reserving the dignity of those, like Peter, who served and returned home, became a chief cause of Hope McDermott's life. The Hope McDermott Day Program Center symbolized those values, and also pays special tribute to those wives, mothers, sister, and daughters, who may never have worn a uniform, but whose humility, service, compassion, and courage, equaled that of the most decorated soldier, and played just as important a role in the preservation of our freedom. At the opening ceremony, John presented a check for $17,355.70 to the Day Program Center which represents the total funds collected to date from the Hope McDermott Fund which is funded entirely by donations from John's fans around the globe. © 1993- John McDermott. All rights reserved.